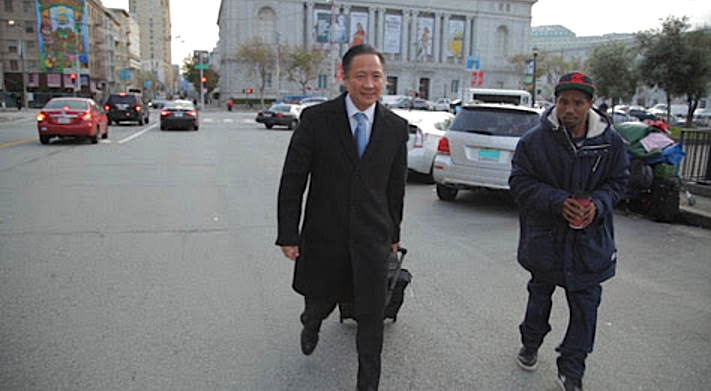 SAN FRANCISCO — San Francisco Public Defender Jeff Adachi, the city’s highest-ranking Japanese American official and the only elected public defender in California, died suddenly and unexpectedly on Friday of an apparent heart attack. He was 59. First elected in 2002, Adachi was re-elected four times. He was known as an advocate for the underdog, including undocumented immigrants that were labeled as criminals by President Trump. He called out police over shootings of unarmed men of color. In addition, he was a filmmaker who promoted Asian American artistic endeavors. A candlelight vigil in Adachi’s memory is planned for Wednesday, Feb. 27, at 7 p.m. at the Hall of Justice, 555 7th St. in San Francisco. Participants will march to City Hall. A public service will be held on Monday, March 4, at 11 a.m. in the City Hall Rotunda. A spokeswoman for the San Francisco Public Defender’s Office said Saturday that Adachi was having dinner with a friend in North Beach when he began to have stomach pains. He was taken to an apartment near Coit Tower, then to California Pacific Medical Center, where he was pronounced dead at 6:54 p.m. According to ABC7, which obtained a police report and interviewed Adachi’s friend Susie Kurtz, Adachi became unresponsive and the friend he had dinner with, Caterina, called 911 from his cell phone at 5:41, then called Kurtz. Paramedics arrived 10 minutes later, administered CPR, and took Adachi to the hospital at 6:29 p.m., leaving Caterina at the scene. By the time police arrived, she was gone. Acting Public Defender Matt Gonzalez, Adachi’s second-in-command and a longtime friend, told ABC7 that Adachi sought medical treatment while representing tenant rights attorney Carlos Argueta, who was found not guilty on Dec. 18 of murder and manslaughter for a fatal stabbing South of Market in 2015. Gonzalez said that Adachi had a “persistent cough” during the trial and saw his primary care physician, who referred him to a specialist for a battery of tests. It was unclear what type of specialist Adachi saw. Gonzalez will serve in an interim capacity until Mayor London Breed appoints someone to take Adachi’s place until the next election. The most prominent cases Adachi was involved in, as listed by The San Francisco Chronicle, included the following. Adachi, saying that the city’s finances were out of control, spearheaded a ballot measure that would have required city employees to contribute more money to their pensions and health insurance costs. Mayor Gavin Newsom opposed the measure and police and firefighters’ unions were angered. When Adachi showed up at a firefighter’s funeral, he was asked to leave. In 2011, Adachi posted surveillance videos on YouTube showing SFPD officers illegally entering the hotel room of a suspected drug dealer without a warrant and taking suspects’ valuables and drugs. This resulted in a federal and city investigation that led to the indictment of six officers and revealed racist and homophobic text messages between officers. Another “textgate” scandal surfaced in 2016. In 2015, an undocumented Mexican immigrant, Jose Ines Garcia Zarate, was accused of discharging a gun and killing 32-year-old Kate Steinle, who was walking with her father on Pier 14. Adachi and his attorneys convinced a jury that the shooting was an accident and Zarate was acquitted of murder and manslaughter. The case was one of those used by President Trump to show that undocumented immigrants pose a danger to public safety. Born on Aug. 29, 1959 in Sacramento, Adachi did his undergraduate studies at UC Berkeley and received his Juris Doctor from Hastings College of the Law in 1985. His parents and grandparents were incarcerated during World War II, and he said that the violation of Japanese Americans’ constitutional rights inspired him to pursue a career in law. Before being elected as public defender in March 2002 — defeating mayoral appointee Kimiko Burton in a rare contest between two Nikkei candidates — Adachi worked as a deputy public defender in San Francisco for 15 years and in private practice for two years. From 1998 to 2001, he served as the chief attorney of the office. He tried over 150 jury trials, including numerous serious felony and homicide cases, and handled over 3,000 criminal matters throughout his career, including some of the Bay Area’s highest-profile cases. He unsuccessfully ran for mayor in 2011, finishing sixth out of 16 candidates. As the only elected public defender in the state, and one of few elected public defenders in the nation, Adachi oversaw an office of 93 lawyers and 60 support staff. The office represents over 23,000 people each year who are charged with misdemeanor and felony offenses. The office provides a panoply of innovative programs to its clients, including Drug Court, Clean Slate expungement services, and a full-service juvenile division. The office also has one of the country’s top intern programs for law students and graduates. 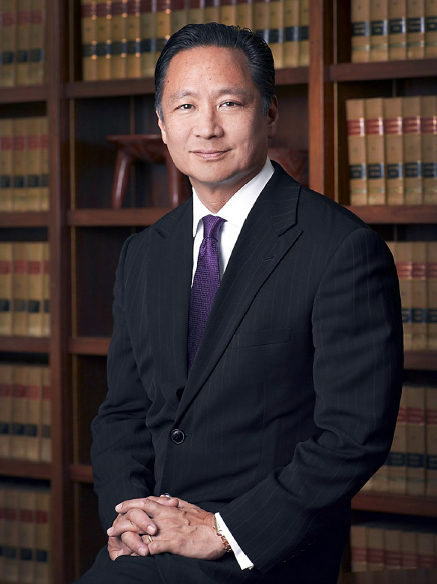 Adachi served on the American Bar Association’s Standing Committee on Legal Aid and Indigent Defendants and was a member of the National Board of Trial Advocacy. He was the co-author of Chapter 25: Immunity for Testimony in the California Criminal Law Procedure and Practice book, and a past board member of the California Attorneys for Criminal Justice and the San Francisco Bar Association. He was a past president of the Asian American Bar Association of the Greater Bay Area and the San Francisco Japanese American Citizen’s League. A certified criminal law specialist since 1991, Adachi taught with BAR/BRI bar review for 15 years and published five books on passing the bar exam. Adachi received several honors for his work: the California State Bar Association’s Hufstedler Award for public service (1992), the Asian American Bar Association’s Joe Morozumi Award for exceptional legal advocacy (1997), the Mayor’s Fiscal Advisory Committee’s Managerial Excellence Award (2000), an award from the Asian American Bar Association of the Silicon Valley (2003), the California Public Defender Association’s Program of the Year Award (2006), the American Bar Association’s Dorsey Award for excellence in public defense (2007), the prestigious California Lawyer Attorney of the Year award (CLAY) for his work in the field of prisoner re-entry (2007), and a second California Public Defenders Association Program of the Year Award for the office’s innovative Children of Incarcerated Parents program (2009). In addition, Adachi was honored with the 2009 Defender of the Year award from the California Public Defenders Association (2010), the National Legal Aid & Defender Association’s Reginald Heber Smith Award for outstanding achievement and dedicated service (2012), the San Francisco Lawyers Club’s Access to Justice Award (2013), and Elected Official of the Year from Vanguard Court Watch (2013). In 2014, his office’s Legal Educational Advocacy Program received a Good Government Award from the civic planning organization SPUR and the City and County of San Francisco and was named Program of the Year by the California Public Defender’s Association. He served on the board of the Asian American Theater Company and established the Asian American Arts Foundation, which presented the Golden Ring Awards — a combination of the Emmys, Oscars, Grammys and Tonys for Asian American performers — in 1995, 1997 and 1999. Survivors include his wife Mutsuko and daughter Lauren. He met his wife, a former Nisei Week Queen, while co-emceeing a Cherry Blossom Queen pageant in San Francisco.